Before Liz and her group transformed my yard, it was a lonely place. No one spent any time there except to try and keep the grass alive. The challenge of limestone under six inches of soil resulted in an a usually brown and crunchy lawn! 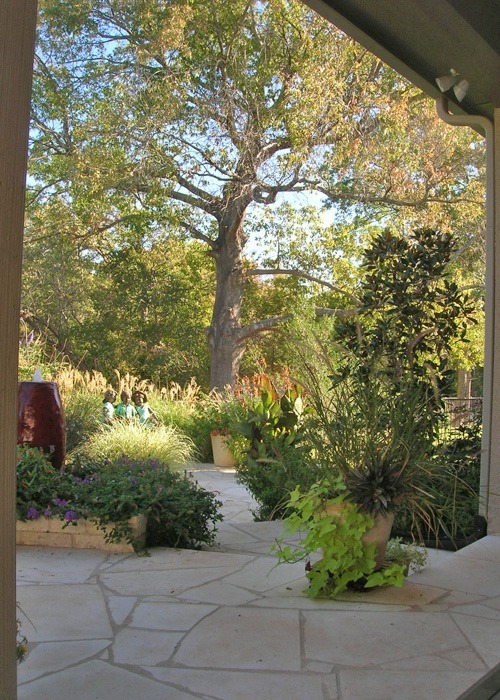 There are lots of beautiful oaks that seemed invisible until Liz featured them in a large gathering area. Two patios separated by a water feature complete with waterfall and stone bridge are now the place for family and friends. Pathways meander through the various raised beds and attract bees, birds, butterflies and a variety of dragonflies. Now the backyard is the focal point of all my home activities! The grass is gone, but I don’t ever want to leave.